If you like some of these stock ideas, check out my guide to getting free stock watchlists from a group of millionaire traders. Watchlists are emailed directly to you with helpful due diligence and insights. Potential trades for everyone from short biased day trades, swing trades to long term buys – very helpful! Also be sure to check out my helpful recommendations page that has a bunch of free tools and resources that I have used to make money trading stocks. Huge winner last week for us! Thanks to this millionaire trader who alerted me to this trade! I love this type of wing trade! RSI is strong and relative volume is very nice! I am not suggesting that you buy this stock at these levels as we probably see a pull back given the recent movement. I would wait for a retracement in price before considering buying. Usually these stocks will pull back and consolidate. Be careful on this one! Shorts are starting to accumulate in anticipation of it coming crashing down. Highly manipulated stock! Still it is worth watching carefully this coming week. I like the look of this oversold bounce play! 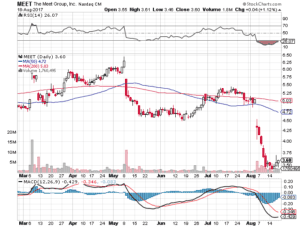 Volume is increasing again and we could see this go above $4 – $4.5 per share soon. I bought in last week for a swing trade so we shall see if it can continue upwards. I don’t usually buy bounces but this one looks very promising on the daily chart. I am terrible at bounce plays so please use your own judgement here! I have a trailing stop loss on this one and probably will not give it much leeway. Again this play was brought to my attention by this superb trader. 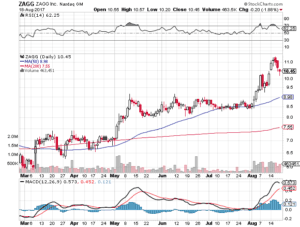 I was pretty happy to see a nice continuation on $ZAGG from my watchlist that I discussed here. This was such a nice textbook breakout, it has to rank as one of the nicest charts that I have seen recently. It is pulling back of highs now but I will continue to watch it for any consolidation. 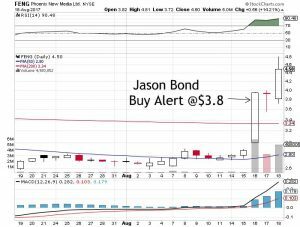 I discussed the nice chart in the $9’s and it hit over $11 per share last week. Superb. Lets hope it consolidates and then continues up. It is always hard to figure out if a breakout is ‘over’ but I will continue to watch $ZAGG. I hope some of these trading ideas for the coming week help you. If you like any of them please do me a favor and share them on social media! Good luck this week trading! P.S. Don’t miss this free swing trading DVD worth $997. I learned my strategy for swing trading stocks from this and highly recommend checking it out!